Don't miss out on the biggest PlayStation 2 game ever! Five years ago Carl Johnson escaped from the pressures of life in Los Santos, San Andreas; a city tearing itself apart with gang trouble, drugs and corruption. Where filmstars and millionaires do their best to avoid the dealers and gangbangers. Now, it's the early '90s. Carl's got to go home. His mother has been murdered, his family has fallen apart and his childhood friends are all heading towards disaster. Liberty City. Vice City. 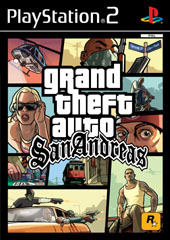 Now San Andreas, a new chapter in the legendary GTA series. Grand Theft Auto returns to the PlayStation 2 this October. "We were being attacked for the medium."